• Just a few minutes' drive to the city centre where guests can easily reach the wonderful history and culture that Bath has to offer. • Take advantage of our special offer - stay 3 nights for the price of 2! The city of Bath, with its beautiful architecture and fascinating history has attracted visitors from around the UK and beyond for thousands of years. However, the city is not just for those seeking culture and with so much on offer here, visitors are really spoilt for choice! Considered one of Britain's most attractive cities, Bath is home to more listed buildings than almost anywhere else in the country. The whole city has been named a World Heritage Site by UNESCO, visitors can find architectural wonders in abundance. Bath has a fantastic selection of shops, restaurants, bars and entertainment options, so you can be sure to find something to suit you. Roman Baths - Ever since the Romans arrived in Bath, life in the city has revolved around the three geothermal springs that bubble up near the abbey. In typically ostentatious style, the Romans constructed a glorious complex of bathhouses above these thermal waters to take advantage of their natural temperature, which emerge at a constant 46°C. Situated alongside an important temple dedicated to the healing goddess Sulis Minerva, the baths are believed to have attracted tourists from right across the Empire, and now form one of the best-preserved ancient Roman spas in the world. Royal Crescent - Bath is rightly celebrated for its glorious Georgian architecture, and it doesn't get any grander than on Royal Crescent , a semicircular terrace of majestic town houses overlooking the green sweep of Royal Victoria Park. Designed by John Wood the Younger (1728–82) and built between 1767 and 1775. They would originally have been rented for the summer season by wealthy socialites, who descended on Bath to indulge in a whirlwind programme of masquerades, dances, concerts and tea parties. Bath Abbey - Looming above the centre of the city, Bath's huge abbey church was built between 1499 and 1616, making it the last great medieval church raised in England. Its most striking feature is the west facade, where angels climb up and down stone ladders, commemorating a dream of the founder, Bishop Oliver King. • Enjoy a day at the races at Bath Racecourse. At Tasburgh House you’ll find comfort in the stylish setting of the drawing room; where better to relax with a newspaper and be served a fresh pot of tea? The garden terraces provide the perfect spot to relax with a drink whilst taking in the stunning views, whether it’s a fine Champagne or a chilled Pimm’s. In addition to the formal gardens, the seven acre grounds also include a beautiful meadow park extending down to the Kennet & Avon canal – perfect for a morning stroll or a picnic prepared by the chef. This offer is based on a Deluxe Room, which can accommodate up to 2 adults. Please note: This is an adult only offer. 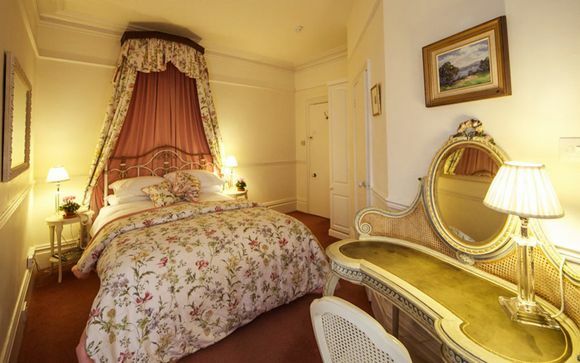 With names based on legendary icons (Wordsworth, Bronte, Tennyson, Austen, Eliot, Keats, Dylan Thomas), the Deluxe Rooms have either twin or double beds (in some cases king-size) and are equipped with en-suite bathroom with bath or shower. This offer is based on a bed and breakfast stay. Our members will also receive a complimentary glass of Champagne on arrival (applicable to bookings staying 1 night only). In the dining room and conservatory, award-winning breakfasts are prepared with the freshest organic ingredients. The bread is from the local bakery and the coffee is the hotel's own freshly ground blend. A perfect start to your day!